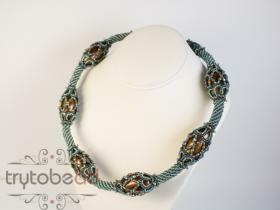 This necklace in a Renaissance style, is, due to the paper mache beads, lighter than you might think. The pattern includes 14 pages with detailed pictures and drawings. 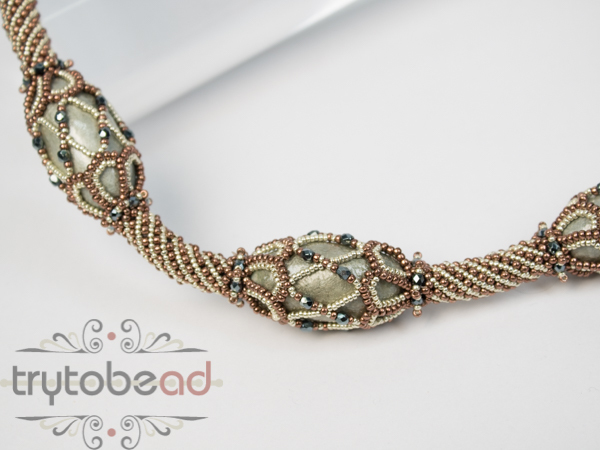 Required supplies: Paper mache beads 40x 18mm (oval), firepolished or round beads 3mm, round beads 6mm, seed beads size 11° and 15°, round clasp 14mm. The matching kits for the pattern include all the beads and a clasp, needed for one necklace of about 57cm.